An hosoban showing a young actor in the role of a peddler of Chinese medicine, an Uiro, in a scene called Uiro-uri. This role is associated with the Danjuro line and Danjuro II did perform it more than once. Published c 1720 by Emiya. Rare. Good impression. 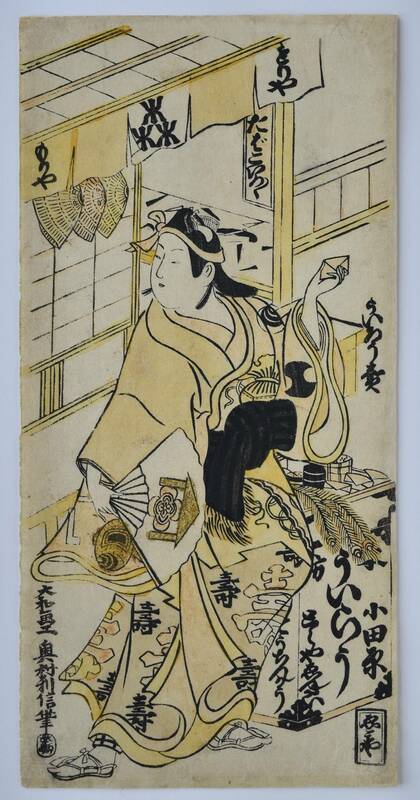 Coloured by hand: mustard yellow, yellow, gold powder and heavy sumi over an embossed pattern. Possibly some fading, otherwise very good condition. Signed Yamato gwako Okumura Toshinobu hitsu. 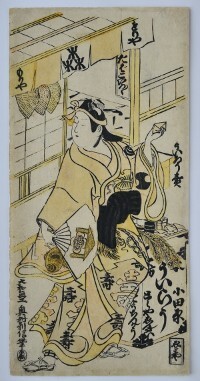 A hosoban showing an interior scene with the actor Ogino Isaburo I ( 1703-48 ), seated and playing a shamisen with a plectrum. Behind him is a courtesan, one hand on the shamisen. Toshinobu may have been the adopted son of Okumura Masanobu. 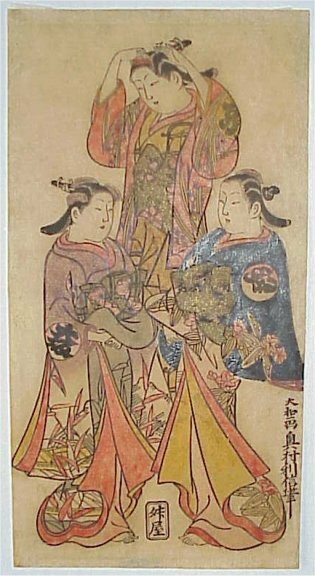 Published by Soshu ( Sagami ) – ya c. 1725-30. Good impression. Nice hand colouring with beni, mustard, yellow, blue and the addition of gum and gold powder ( bronze or brass ). Slight toning and loss of gold. Unsigned. A hoso-e showing three beauties representing the three major Japanese cities: Kyoto; Osaka, and Edo. Published c1729. Very good impression. Urushi-e, coloured by hand in mustard, lilac, green, beni, gold and heavy sumi over embossed pattern. Some toning, otherwise good condition. Signed Yamato gwako Okumura Toshinobu hitsu.